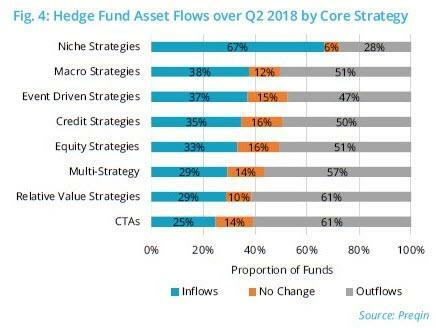 Using data from Preqin’s online platform, we look at hedge fund asset flows in Q2 2018 by strategy, fund size, manager headquarters and performance. 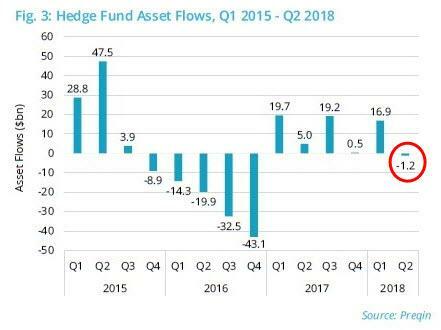 In Q2 2018, hedge funds recorded their first quarterly outflows since Q4 2016. Despite investors withdrawing $1.2bn in capital in Q2 2018, performance has driven hedge fund industry assets under management (AUM) to a record high of $3.61tn as at June 2018 (Fig. 1). Credit strategies attracted the greatest volume of inflows ($10.7bn) in Q2, helping to bring H1 2018 net asset flows to $18.5bn – the greatest of any top-level hedge fund strategy tracked by Preqin. Event driven strategies closely followed with net asset flows of $9.2bn in Q2 2018; following these capital inflows, as well as consistent performance throughout the quarter, AUM for the strategy reached $217bn, marking an increase of 6.3% since the end of 2017. North America was the only region tracked by Preqin to generate net inflows in Q2 2018: fund managers based in the region attracted an influx of capital totalling $22.0bn (Fig. 2), with 42% of North America-based fund managers witnessing inflows (Fig. 6). European outflows persisted for the second quarter of 2018, totalling $13.9bn for the year so far. In addition, only 26% of Europe-based funds recorded inflows during Q2, while 62% were subject to net outflows. Asia-Pacific and Rest of World regions also recorded outflows amounting to $2.9bn and $16.2bn respectively. When examining asset flows by fund size, Preqin data suggests that capital is heading into the hands of the larger funds. Fifty-one percent of funds that hold AUM greater than $1bn experienced inflows in Q2 2018 (Fig. 5). In contrast, among funds less than $100mn in size, only 31% observed inflows while 55% were subject to outflows, indicating that investors are looking to the safer option of the larger fund managers. A fund manager’s ability to attract new capital is heavily reliant on its track record. Thirty-five percent of funds that posted a return of 5.00% or greater for 2017 recorded inflows during the second quarter of 2018 (Fig. 7). This is in contrast to funds that returned less than -5.00%, with only 21% of these funds generating inflows. Similar trends can also be identified over the longer term: 36% of funds with a three-year annualized return of 5.00% or higher made inflows, while in comparison, only 21% of those that returned less than -5.00% over the period achieved the same (Fig. 8).